In this instalment, we analyse the stability of a single wheel, a bicycle, tricycle, and, finally, of a four-wheeled vehicle. In the offing, we introduce force moments, vector cross products, matrices and linear algebra, and some interesting facts about how the number of wheels on a vehicle relate to the number of dimensions of space and to the practice of weight jacking on a race car. The next figure shows the wheel just starting to tip over. One can easily see that the weight, pulling down on the CG, and the reaction force, pushing up on the CP, will quickly knock the wheel down to the ground. At any instance of time, the tendency for the wheel to fall over is measured by the moment of the forces about some arbitrary point. 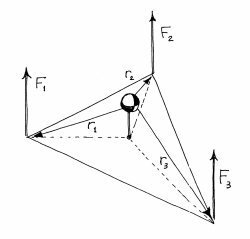 The moment of a force about a point is the magnitude of the force times the perpendicular distance of the force line from the point. We suggest this perpendicular distance in the following diagram with a small right triangle. 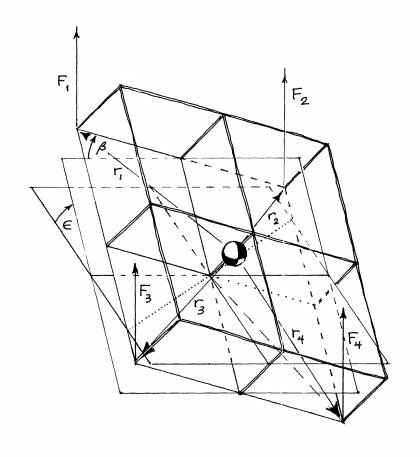 Since the CP is not sliding, by assumption, it's fixed in inertial space and is an ideal candidate for a moment centre: the point about which to compute force moments. There is also a small, sideways component to the ground's force on the CP, but we ignore that in the diagram. Furthermore, the cross product we need satisfies the right-hand rule, whereby r, rotated into F by a right-handed twist, as though by turning a right-handed screw or faucet handle, would advance the screw in the direction of T. The opposite product, F r, would have the opposite sign. There are many more interesting properties of the cross product, for which we refer you again to http://www.britannica.com. Let's go back to our unicycle wheel. Generically, a physical system is unstable if small inputs lead to large outputs, say, if ambient forces amplify little disturbances. The fact that our wheel falls over with just the slightest disturbance, almost by itself, indicates that the one-wheel system is unstable. By the way, a wide race tyre will not tip over by itself until it's pushed sideways far enough that the line of the gravitational force vector lies outside the edge of the tyre. At that point, the restoring force, pushing up on the edge of the tyre, can no longer counteract the tipping-over, twisting tendency of gravitation. A complete, ride-able unicycle is even more unstable than a unicycle wheel, because a rider must also keep himself from falling backwards or forwards by continuously adjusting pressure on the pedals. A ride-able bicycle does not suffer forward-backward instability since the CG is between the front CP and the rear CP. However, it does suffer left-right instability, and the rider must continuously adjust body weight and steering input - which generates sideways restoring force - to keep the bike from falling over. Going from one wheel to two wheels eliminates one form of instability. How about going to three wheels? Obviously, there is no solution if d, the determinant, vanishes. It is an interesting exercise to find out all the geometric circumstances in which one or more of these forces vanish or to catalogue all the possible ways in which the determinant can vanish. I will leave these exercises to the reader. Before leaving the tricycle, I'd like to assert without proof that the fundamental, geometric reason we can solve for the normal forces is that ANY three points define a plane. No matter how the tricycle is positioned on any (sufficiently horizontal) plane, all three wheels will touch the ground and three normal forces will be generated. We now take a huge risk and generalize TWO aspects of the model at once. First, we go to four wheels. Second, we tilt the plane upward by a small angle and bank it by a small angle . Going to four wheels will cause our equations to break down because there is TOO much symmetry in the vehicle and blind application of linear algebra cannot derive, unambiguously, how the normal forces are to be apportioned among the wheels. Four points cannot lie on a plane unless they are exquisitely balanced there. We restore sanity by expressing the desired symmetry explicitly, and this makes for a bit of interesting math. Physically, in a four-wheeled vehicle with a suspension, it is very easy to load wheels preferentially by jacking the springs up or down. NASCAR crews are often furiously spinning wrenches above the rear wheel purchases in the pits, effectively jacking weight into or out of wheels to adjust handling. In a three-wheeled vehicle, weight jacking is not possible, to first order, that is, so long as the CG does not tip appreciably. Playing around a little with the spring heights on a tricycle will not affect the weight on each wheel. We've gone on long enough in this article. We'll leave it to a later instalment or to the reader to work with some numerical values and plots.